Last night (June 19) at 8:30 p.m., police responded to a weapons call at a rooming house at the corner of Water and London streets in Peterborough. The rooming house, located at 557-559 Water St. — a block away from the Peterborough police station — is well known to police. Police closed London and Water streets and deployed its Emergency Response team to search and clear the house of suspects and weapons. The operation concluded at 3 a.m. this morning. The area is now open again to the public and those evacuated from their residences have been allowed to return. As a result of the investigation, no weapon was located. However, police arrested and charged two men. One man was wanted on a warrant held by Calgary Police for fraud charges, and the other man is a resident of the rooming house. Melvin Jacobs, 55, of Water Street, is charged with possession of marijuana under 30 grams. The accused was released from custody and is scheduled to appear in court on July 13, 2017. 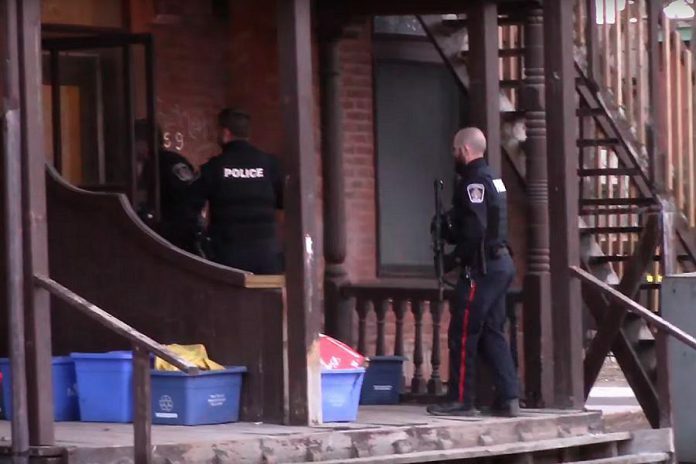 The rooming house has been the scene of multiple weapons offences over the past year: in August 2016, there was a drug-related stabbing; in March 2017, there was a shooting; in April 2017, two men were arrested for weapons offences. All incidents have required the police to shut down streets in the area for public safety.